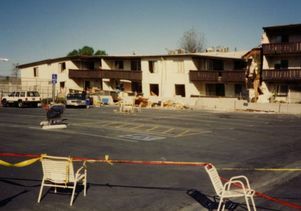 Several apartment buildings collapsed in the January 17, 1994 Northridge earthquake. The 1994 Northridge earthquake was one of the costliest natural disasters in U.S. history. Fifty-seven people died, more than 8,700 were injured, and property damages amounted to billions of dollars. In the 25 years since the 6.7 quake shook Southern California at 4:30 a.m. on Jan.17 — collapsing buildings, bridges and freeways — what have we learned? Quite a lot thanks in part to the work of scientists and engineers at UCLA, who are continuing to make structures safer and help identify earthquake hotspots. 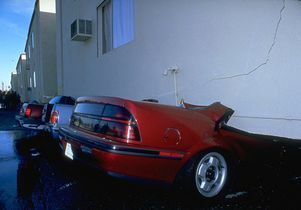 Nearly half of the people who died were trapped in buildings with “soft stories,” the openings on the first level often used for parking spaces in smaller apartment buildings. Due to a lack of support below, apartments came crashing down. In 2015, Los Angeles Mayor Eric Garcetti signed a measure requiring seismic retrofitting of soft-story buildings within seven years, and provided 25 years for upgrades to concrete structures. 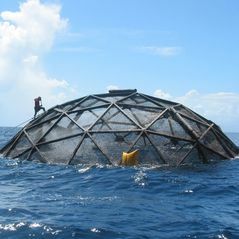 Bozorgnia and other UCLA engineering researchers are now amplifying their knowledge with the latest information and technology that simply wasn’t available 25 years ago to mitigate damage from future temblors. Technology, such as ShakeAlertLA, an earthquake warning application released by the City of Los Angeles earlier this month, is a reminder of the ongoing behind-the-scenes expertise required in keeping Angelenos as safe as possible. Structural engineering professors Henry Burton and John Wallace are working with the City of Los Angeles to systematically assess data from accelerometers, or sensor networks, placed in downtown Los Angeles’ skyscrapers. Using data, such as the ambient vibration in buildings that comes from the surrounding environment, which often remains unanalyzed, Burton and Wallace aim to model and contribute to the design of tall buildings that can better withstand the forces of an earthquake. They also want to help establish a coordinated response to earthquake damage and disruption throughout downtown Los Angeles. Additionally, Burton is using artificial intelligence to help guide post-earthquake inspections to assess how much the structural strength of tall buildings is reduced by earthquake damage. The technology can inform optimal sensor placement in these buildings, as well as provide real-time risk projections in aftershock environments. Chukwuebuka Nweke, a UCLA postdoc in geotechnical engineering, is studying basin effects in Southern California using relational databases, cloud computing, and machine learning techniques. Southern California is a geologically diverse region composed of flat low-lying areas consisting of sediment-filled basins surrounded by mountains. The thick sediments in the basins influence propagation of earthquake waves, causing them to be different from the ground motion at the bottom of the basin, which leads to shaking on the surface that is higher in intensity (or lower) than what would be expected based on the size of the waves traveling deeper below ground. Nweke’s research explores the extent to which local basin models differ from similar models of other parts of the world, and will result in a region-specific model that will improve seismic hazard analysis in Southern California. Using Google Earth and images harvested from Google Street View, which didn’t exist in 1994, Ertugrul Taciroglu, professor of civil and environmental engineering, and his students are developing computer codes that locate individual structures and examine them through Street View from multiple angles. The algorithms are used to develop detailed models for seismic risk assessment, with particular emphasis on California bridges and Los Angeles’ collapse-prone, pre-1974 (non-ductile) reinforced concrete building inventory. The team is extending their work toward risk assessment for other hazards affecting urban regions such as wildfires and extreme wind events. Wallace and his students have worked with international researchers to develop a robust database of tests conducted on reinforced concrete structural walls. This data has been instrumental in improving the building code for concrete structures, including guidelines for new skyscrapers in Los Angeles and major cities along the West Coast. Civil and environmental engineering professors Scott Brandenberg and Jonathan Stewart study ground failure during earthquakes, a major cause of which is liquefaction, a process in which soil loses substantial strength. The team is working on the Next Generation Liquefaction project, a global collaboration led by UCLA and the University of Washington to redefine how liquefaction and its effects are predicted. The project team has developed an innovative community relational database of liquefaction case histories, and implemented it using cloud-based computing so engineers can execute and share their data entirely online. Bozorgnia and Stewart play critical roles, along with collaborators across the globe, in major projects designed to help predict earthquake ground motions from future earthquakes. One product of this work is ground motion hazard maps that show anticipated levels of ground shaking from future earthquakes across the United States. These maps are used in building codes. A great deal of research goes into producing the models used to predict ground motions, much of which occurs at UCLA. Researchers here have generated models for different tectonic regimes, including mid-plate regions (Central and Eastern United States), subduction regions (Pacific Northwest), and active tectonic regions like California. The work defines the current state-of-the-art for ground motion prediction, which is an essential component of earthquake engineering research and practice. The UCLA Civil and Environmental Engineering Department will host the next Pacific Earthquake Engineering Research Center’s annual meeting, “Seismic Resilience 25 Years after Northridge: Accomplishments and Challenges,” at UCLA Jan. 17–18. 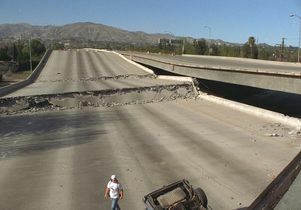 The 118 Freeway in Los Angeles incurred damage in the Jan. 17, 1994 Northridge earthquake.